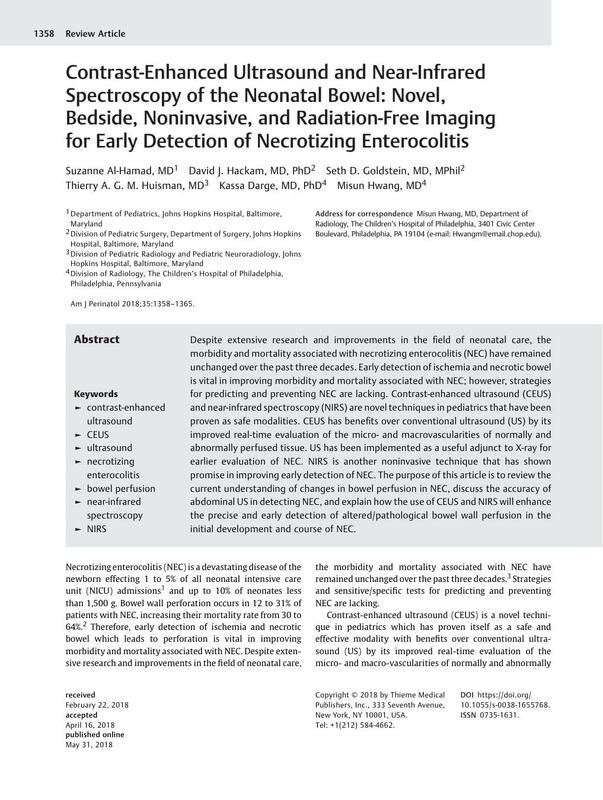 Despite extensive research and improvements in the field of neonatal care, the morbidity and mortality associated with necrotizing enterocolitis (NEC) have remained unchanged over the past three decades. Early detection of ischemia and necrotic bowel is vital in improving morbidity and mortality associated with NEC; however, strategies for predicting and preventing NEC are lacking. Contrast-enhanced ultrasound (CEUS) and near-infrared spectroscopy (NIRS) are novel techniques in pediatrics that have been proven as safe modalities. CEUS has benefits over conventional ultrasound (US) by its improved real-time evaluation of the micro- and macrovascularities of normally and abnormally perfused tissue. US has been implemented as a useful adjunct to X-ray for earlier evaluation of NEC. NIRS is another noninvasive technique that has shown promise in improving early detection of NEC. The purpose of this article is to review the current understanding of changes in bowel perfusion in NEC, discuss the accuracy of abdominal US in detecting NEC, and explain how the use of CEUS and NIRS will enhance the precise and early detection of altered/pathological bowel wall perfusion in the initial development and course of NEC.